Café Brava - busy night. On the basis that Summer (mighty fine as it has been) seemed to have ended come August therefore limiting my chances of firing up the BBQ, Mrs. SF and I decided (before Big Bad Bertha – the storm – rather than a person – arrived) to go out to dinner last weekend. 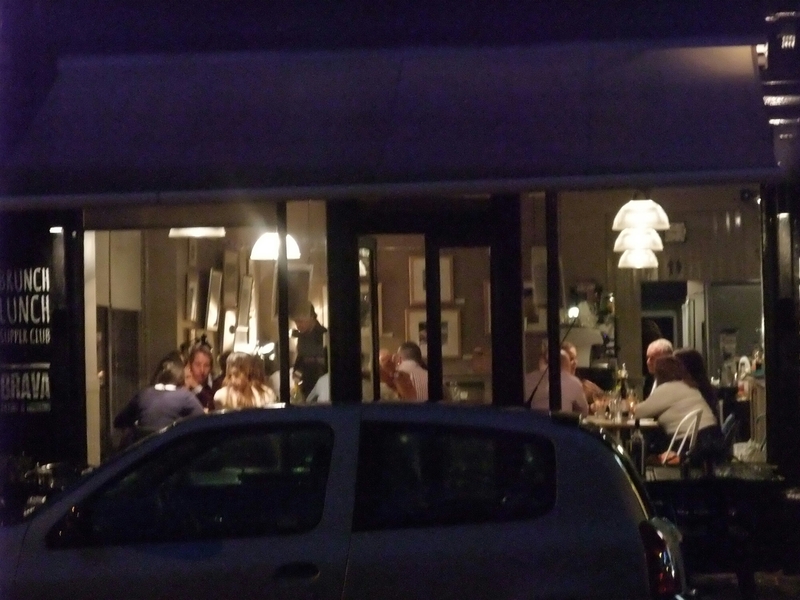 The spot chosen was Café Brava, which is a much loved “Yummy Mummy” frequented café in the heart of Pontcanna (an uber trendy part of Cardiff ), which of an evening transforms into a compact and bijou bistro. The rather stellar feature that Café Brava has is a policy of no corkage charge on BYO wine and fizz after 6pm each evening. For a wine lover like me this is, in marketing terms, a killer USP. One of the down sides of liking a drop of wine is that I am aware of the retail price of most wines and thus the mark up a restaurant puts on wines they sell. The level of mark up applied to wine by restaurants in the UK is quite frankly disgracefully high. Yes, I know this is how they make their money, but restaurants in other European countries seem to survive without 250% + mark ups on wine. By way of example, last September I bought a bottle of Predicador (a mighty fine white rioja) in the Michellin starred restaurant El Portal in Ezcaray, La Rioja (beautiful town and fantastic restaurant – go if you are anywhere at all near it) for €28 (it retails in Spain for about €20). Same wine retails in UK at around £20, but see if you can find it for less than £50 on a list in a restaurant in the UK – you won’t. So Spanish mark up – 40%, UK mark up – 250%. The mark up on cheaper wines in the UK is even worse, often being up to 400%. So on this basis you can see the allure to me (and any sane person) of Café Brava’s evening no corkage policy. Bring your own wine which you know you will like and no hideous mark up to pay. It certainly works as the place seems to be consistently busy and was packed on the night in question. I choose an interesting Somerset Pinot Noir rosé from Dunleavy Vineyards (I had picked up the previous day in Bristol from the splendid Grape and Grind on Gloucester Road) as Mrs. SF is rather partial to a rosé and a nice red rioja (which I am very partial to) and put them in my wine carry case (with vacum pump and stoppers as we wouldn’t drink a bottle each) all ready to go. Taxi arrives and Mrs. SF and I get in (after the usual panto of getting out of the house without taking the dogs). As we exit the taxi I realise (followed by a number of choice expletives) I had forgotten the wine. I then had to hotfoot it to a wine shop in Pontcanna to get a replacement bottle, with Mrs SF looking at me as if I was a blithering idiot (quite rightly so in this case). 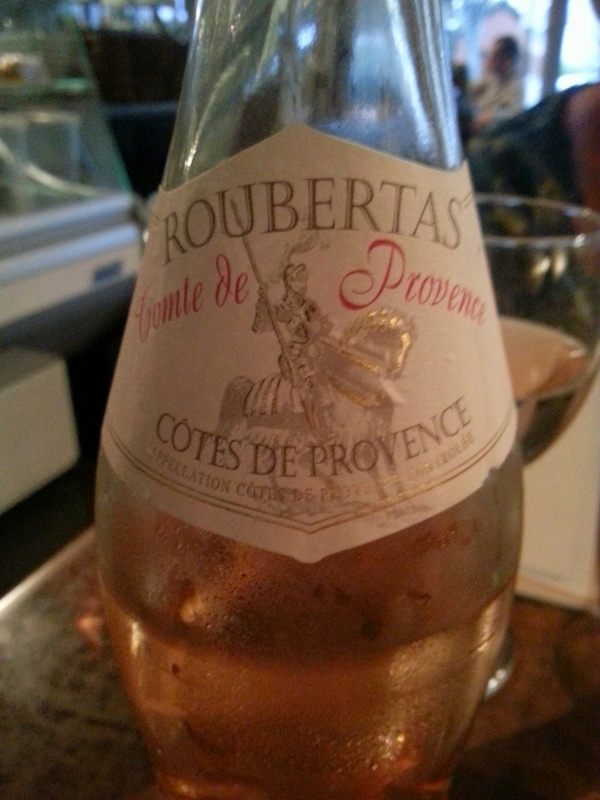 I picked up a Provence rosé as it was my fault had forgotten wine and Mrs.SF fancied a glass of rosé. Being the gent I am, I resisted the temptation of picking up a rioja and lying by saying the shop didn’t have any decent rosé (the thought did cross my mind though). So we arrived at the restaurant slightly flustered and without our (my) wines of choice. 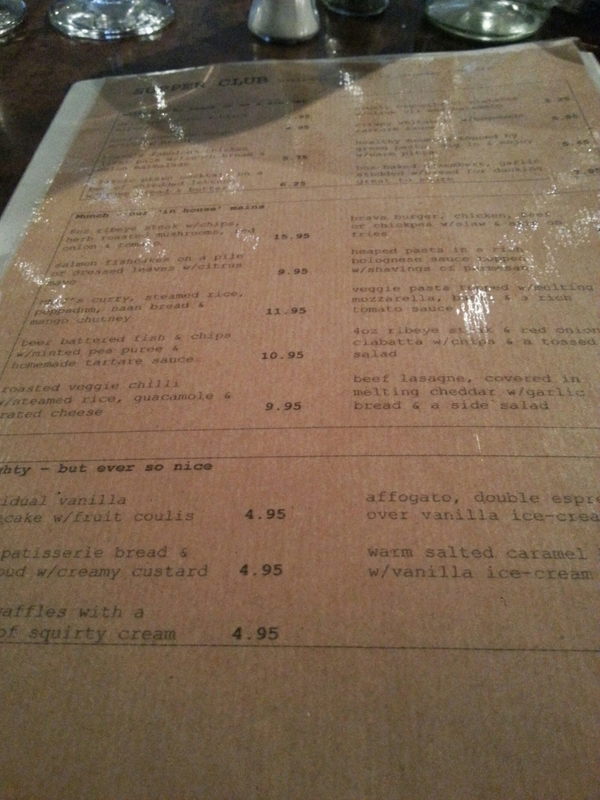 The menu is a mix of café staples (e.g. steak and chips etc ) supplemented by more sophisticated specials, which change weekly. 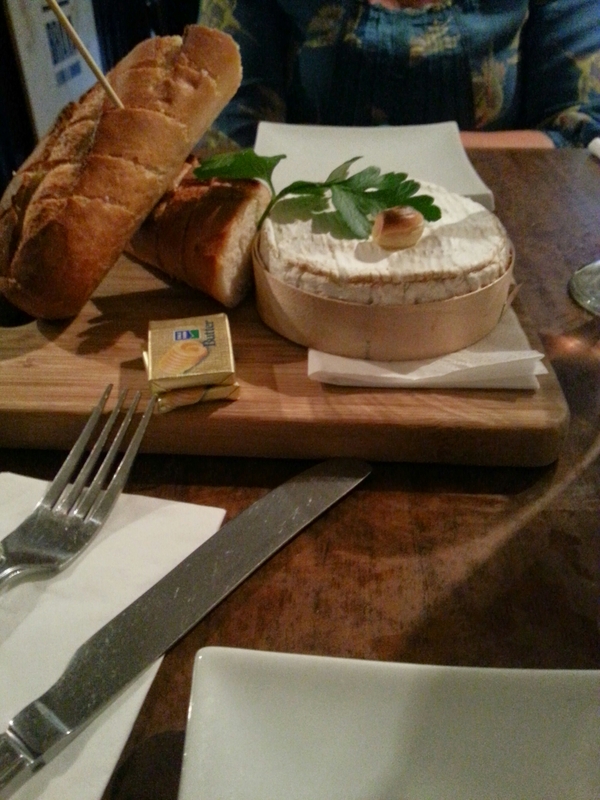 We started off with that bistro classic “oven baked” camembert (£7.95) which we shared. 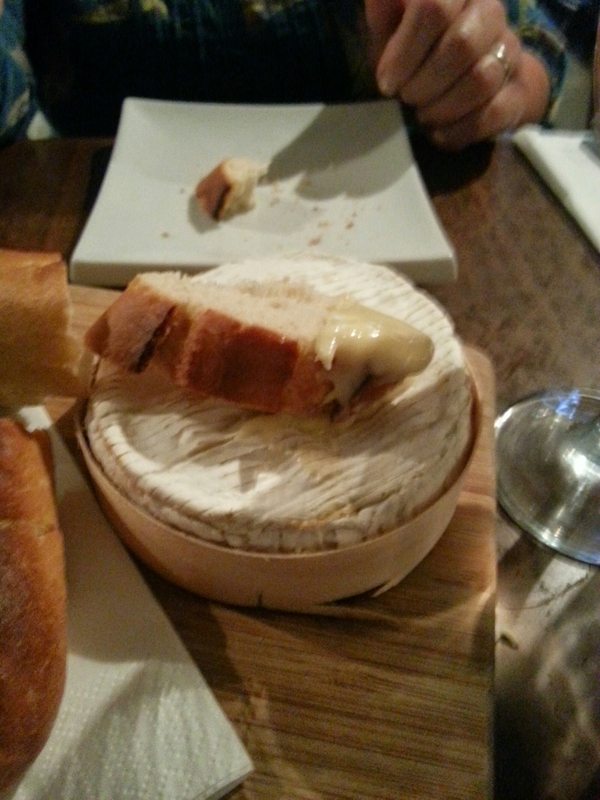 I love the wobble on a baked camembert, but it was sadly lacking here. On jabbing it with a knife I expected golden cheese to oozes out, alas it didn’t. Whilst I looked bemused, Mrs. SF took a more proactive approach and stuck her finger in the hole the knife had made and pronounced it fridge cold inside. Somewhat miffed, we sent it back. The camembert returned suspiciously quickly having been, I suspect, microwave oven baked (unless they have a blast furnace in the kitchen). It was perfectly nice and rummy with a good hit of garlic. It was, however, incomprehensible to me how such a simple dish could have made it out of the kitchen in its initial unbaked state. 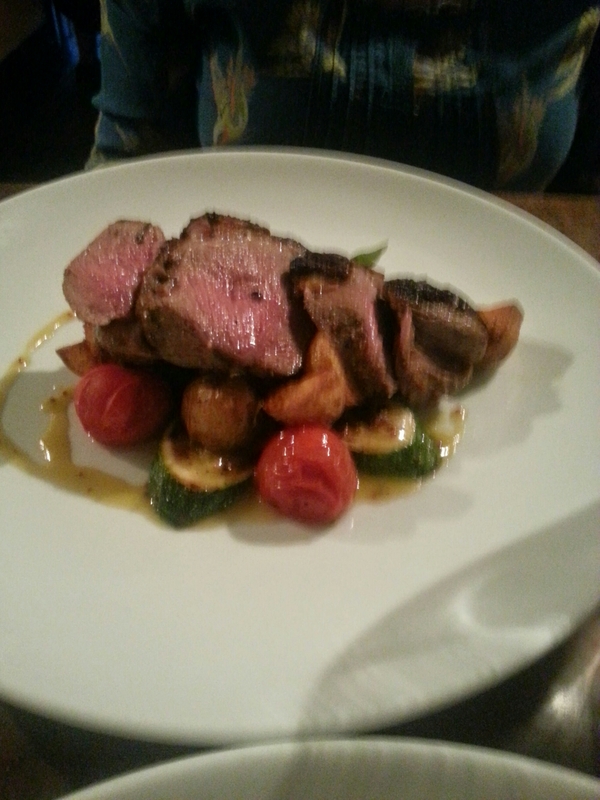 Next up, for mains, we both had the rump of lamb “cooked how you like it” (their words on the menu) with crispy potatoes, cherry tomatoes and courgettes (£14.75). Both Mrs SF and I like our lamb cooked pink and duly requested this on ordering, as after all it said on the menu “cooked how you like”. Mrs.SF’s came out a lovely rosey pink and had a good flavour to it. 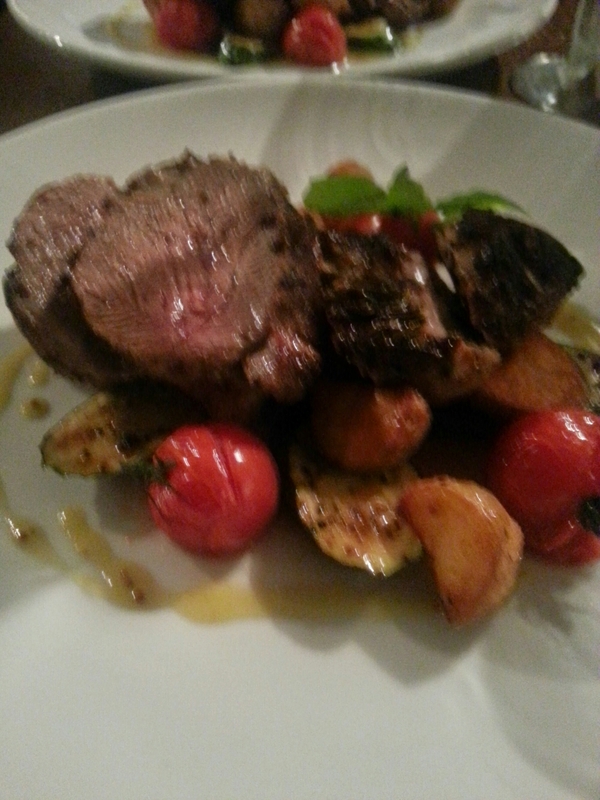 It was topped with a rosemary and garlic crust which nicely complimented the lamb. The same could not be said of mine. Whilst my lamb was perfectly OK and tasted fine, it was not pink bar from one piece which had a hint of pink of it. The rest of it was distinctly medium. It really should have been obvious to the kitchen that only one of the dishes was as ordered. I thought about sending it back, but this would have meant Mrs. SF either eating hers while I waited or her dish getting cold. I decided to let it go (having already sent one dish back), but it was most certainly not “cooked how I like it”. My lamb - not so pink. The accompanying veg. was nicely cooked although the crispy potato potion was a little bit miserly. I estimate one small cubed new potato each so more a case of crispy potato rather than potatoes. On to pudding and, as the special of lemon meringue had run out, we both went for the chocolate brownie (£4.95) with a caramel topping, chocolate sauce and vanilla ice cream. Mine was lovely and gooey, exactly how a good brownie should be (I would have preferred it warm mind). Mrs. SF’s on the other hand was a touch on the dry side (it looked like a corner piece) and lacked the gooeyness so evident in mine. Whilst there was nothing intrinsically wrong with it, it was merely OK as against the good one I got. So again inconsistency, with me being the winner this course. 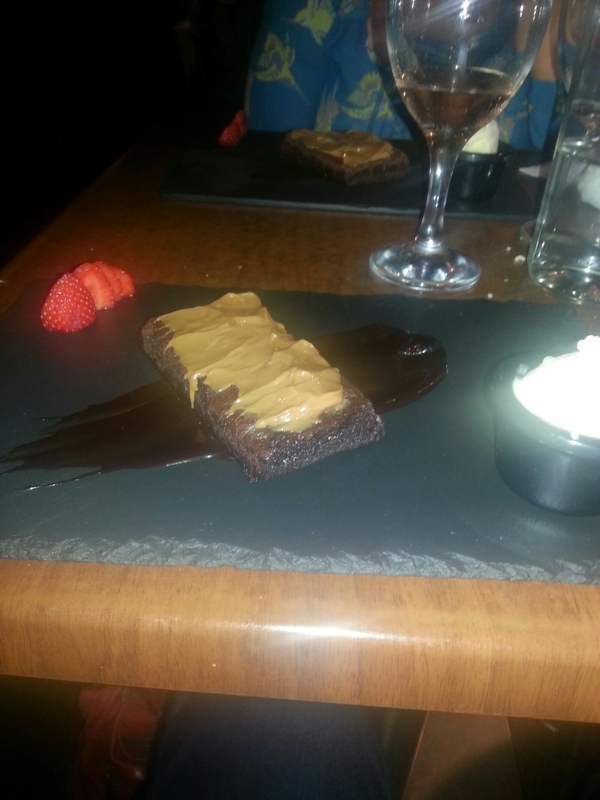 The brownies came on a slate, which may look pretty, but really is not the best choice for a desert that requires the scraping up of chocolate sauce with a metal implement. Think fingernails running down a blackboard – not pleasant at all. Use of slates to serve (rather than display) food is something that particularly annoys Mrs. SF and something I also just don’t get. Please can someone tell me what is wrong with a good old fashion plate. We finished off with a couple of decent espresso coffees (me a double and Mrs. SF a single) before braving the elements. 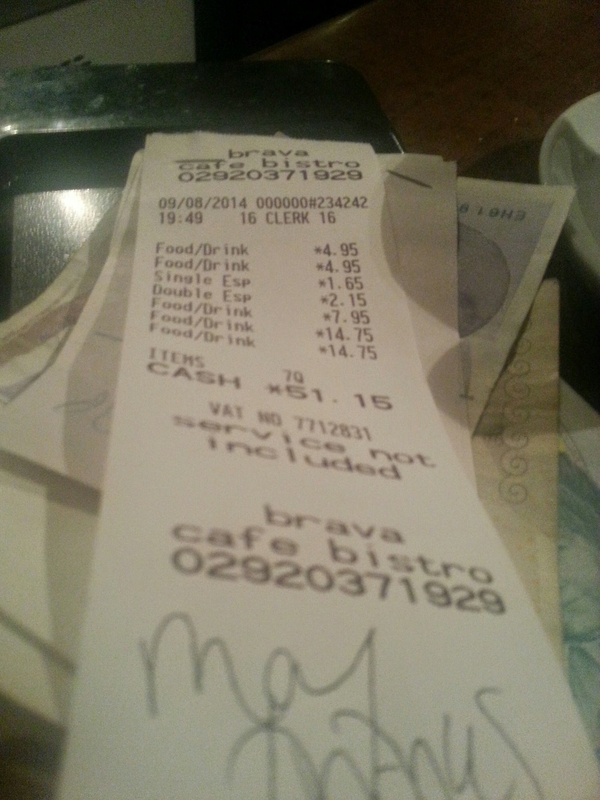 The damage was just over £51 without tip. Not cheap but not bad value at all, especially when you can have a decent bottle of wine to go with your food (if you aren’t an idiot like me and actually remember to bring one – there are a number of shops in vicinity selling wine if don’t!) at retail cost. 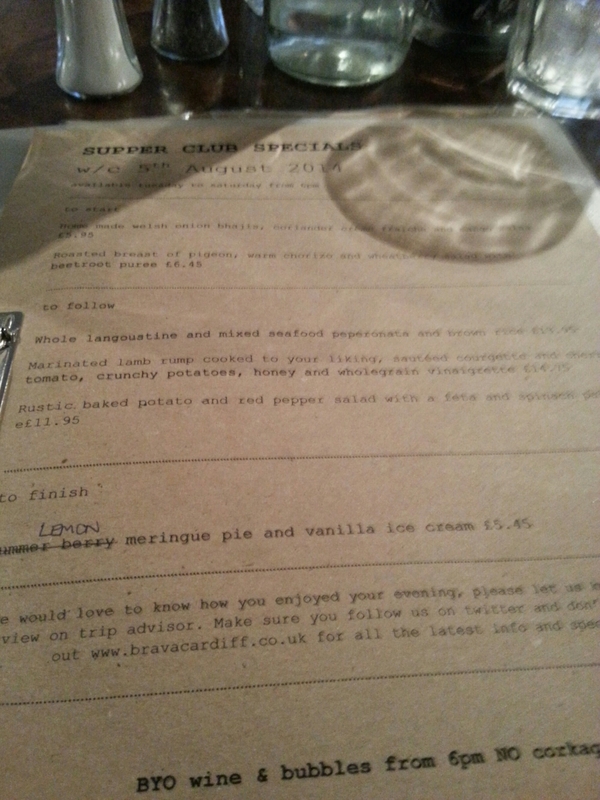 I have a real soft spot for Café Brava due to their no corkage charge in the evening policy. Elements of the meal were good (Mrs.SF’s lamb and my brownie), but other were merely OK (my lamb and Mrs. SF’s brownie) and there really is no excuse for an advertised oven baked camembert coming out of the kitchen fridge cold in the middle. Maybe we caught them on a bad night as it was very busy, but it was the inconsistency that was maddening as clearly someone in the kitchen can cook as shown by some (but not all) of the food we were served. Would I go back? Yes, due to corkage policy, but the kitchen really needs to cut out the schoolboy errors. Sort these out and it will be fab. I’ve been playing around with the wine app vivino which upon scanning the wine bottle label will tell you the price and show you other users reviews. I’ve been staggered by the markup in wines. We ordered a bottle of la battistina gavi (don’t judge me) in the park house. Retail £9, restaurant price £28. I then saw the same bottle in scallinis – £28.50. Makes me just want to have water…. 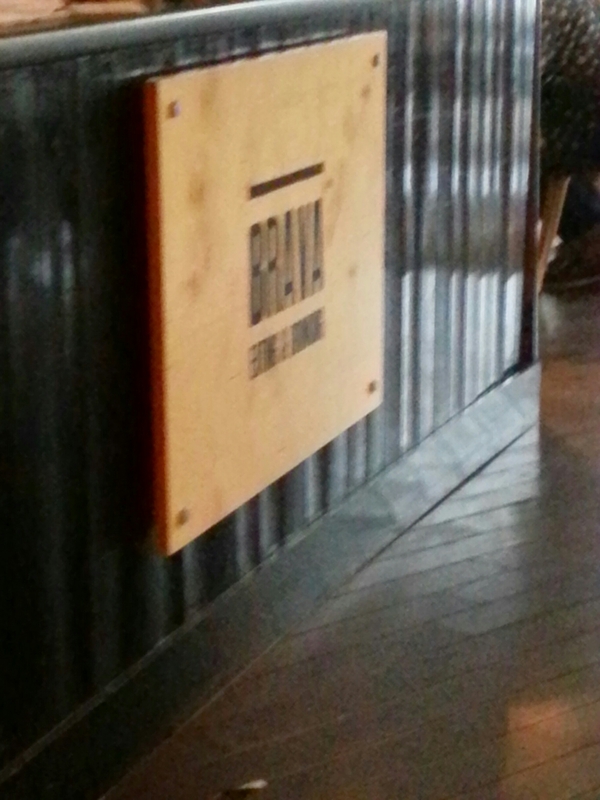 Visted Brava today for breakfast to start off my wifes birthday , service was very poor and food was under cooked , staff didnt seem that bothered when i mentioned the food. considering that there are other lovely cafes very close, i would have thought that they would have been alot sharper that that. Very sloppy. I thought it had a good reputation but i wont take long to ruin it if they carry on like this , pull your socks up Brava. this is the latest restaurant review straight from the blog Soliciting Flavours, Mr SF’s knowledge of wines and beers is extensive. In this post he tells of the extremely high mark up on the price of wine when purchased in a UK restaurant. Thanks – been posting for about 6 month now. This entry was posted on Aug 17, 2014 by solicitingflavours in Alcoholic drink, Cardiff, Drink, Food, Food and wine products, No corkage, Restaurant Review, Rioja, Rosé, Wales, wine mark up.